Eyeglass lenses are glass or plastic optical items that fit inside eyewear frames to enhance and/or correct the wearer's vision. The magnifying glass, invented in the early 1200s, was the first optical lens used for enhancing vision. Made from a transparent quartz and beryl lens, the invention revealed the critical discovery that reflective surfaces ground to certain angles could enhance vision. Following this invention, Alessando di Spina introduced eyewear to the general populace. Due to the increasing demand for eyewear, quartz and beryl lenses were virtually replaced by glass lenses. The convex lens was the first optical lens used in glasses to aid the correction of farsightedness, but other corrective lenses followed, including the concave lens for the correction of near-sightedness, and more complex lenses for the correction of astigmatism, as well as the invention of bifocals by Benjamin Franklin in 1784. In the past, opticians relied on separate optical laboratories to produce eyeglass lenses. Today, there are a number of full-service optical outlets that produce lenses for customers on-site. However, optical outlets do receive lens "blanks"—plastic pieces already formed to close-to-exact size with different curves ground into the front of the lens—from optical laboratories. Blanks with different curves are used for specific optical prescriptions. After the lens blanks are received from the factory, the optical laboratory technician selects the appropriate blanks and puts them in a lensometer. This is an instrument used to locate and mark the "optical center"—the point that should be centered over the customer's pupil—of the lens blanks. depending on the extent and type of correction required. In addition, the bevel surrounding the edge of the lenses will be designed to hold the lenses in the desired eyeglass frames, and some lenses, such as those for metal and rimless frames, will require more detailed edging to fit securely in the frames. Various grades of plastic are used for eye wear, but the most popular is the "Feather-weight," an impact-resistant polycarbonate plastic. This type of plastic lens is more durable and 30 percent thinner and lighter than regular plastic lenses. It is also the more expensive lens. Other lens types include the standard "CR 39" trade name plastic lens—CR 39 is a monomer plastic—and the "High Index" plastic lens, which is 20 percent thinner and lighter than ordinary plastic lenses. 1 The optical laboratory technician inputs the optical prescription for a pair of plastic lenses in the laboratory's computer. The computer then provides a printout specifying more information necessary for producing the required prescription. 2 Based on this information, the technician selects the appropriate plastic lens blanks. Each blank is placed in a prescription tray along with the customer's eyeglass frames and the original work order. The prescription tray will remain with the technician throughout the production process. Although the appropriate curves have already been ground into the front of the lens, the technician must still grind curves into the back of the lens. This is done in a curve generator. After polishing the lenses, they are put in an edge grinder, which grinds each lens to its proper shape and places a bevel around the edge so that the lens will fit the eyeglass frames. Following any necessary tint applications, the lens are put into the frames. The plastic blanks have different curves already ground into the front of them; therefore, the technician must select the blank that corresponds to the optical prescription required for each lens. The rest of the optical prescription, or power, must be ground into the back of the lens. 3 The technician places the lenses in a lensometer, an instrument used to locate and mark the "optical center"—the point that should be centered over the customer's pupil—of the lens blanks. Next, adhesive tape is affixed to the front of each blank to keep the front from being scratched during the "blocking" process. The technician then places one lens blank at a time in a "blocker" machine, which contains a heated lead alloy that fuses the block to the front of the blank. The blocks are used to hold each lens in place during the grinding and polishing processes. 4 Next, the technician places each blank into a generator, a grinding machine that is set for the optical prescription. The generator grinds the appropriate optical curves into the back of each lens. After this step, the lenses must be "fined," or polished. 5 The technician selects a metal lens lap —a mold corresponding to the required optical prescription of the lens, and both lenses are placed in the fining machine with the back of each lens in the appropriate lap. The front of each lens is then polished in a series of fining operations. First, each lens is rubbed against an abrasive fining pad made of soft sandpaper. After a second fining pad made of a smooth plastic is placed over the original sandpaper pad, the lens is polished again, as the fining machine rotates the pads in a circular motion while water flows over the lenses. After the initial fining process is completed, the two pads are peeled off and thrown away. 8 Each lens is marked "L" or "R" with a red grease pencil, indicating which is the left and right lens. 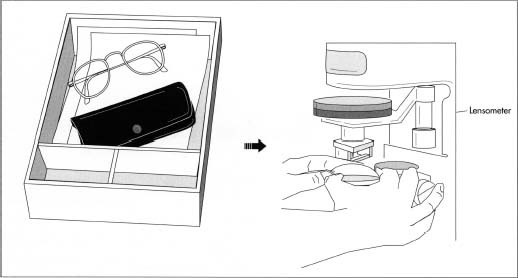 After the lenses are again placed in the lensometer to check and mark the optical center and inspect the other curves necessary for the proper optical prescription, a leap pad —a small, round metal holder—is then affixed to the back of each lens. 10 If the lenses require additional grinding, the process is done by hand using a mounted power grinder. 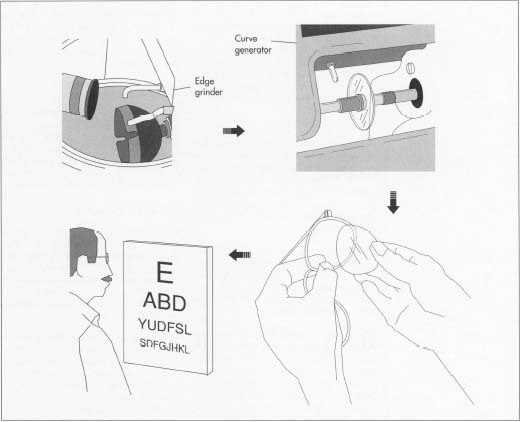 This step is necessary for lenses to be inserted in metal or rimless frames, which require more precise bevels. 11 Finally, the lenses are dipped into the I desired treatment or tint container. After drying, the eyeglass lenses are ready for insertion in the desired frames. The optical laboratory may send the lenses back to the optical outlet without the frames, in which case the optical outlet will insert the lenses in the frames. "High-Speed Spindles Aid in Fabricating Plastic Eyeglass Frames with Special Finishes." Plastics Design & Processing. December 1983/January 1984, p. 21. Krasnow, Stefanie. "Athletic Specs: The Eyes Have It." Sport. August, 1987, p. 97. More Than Meets the Eye. Optical Laboratories Association. "Plastic Beats Acrylic for Lenses." Design News. August 18, 1986, p. 29. I ve found it educative.im an optic technician.im specialised in fitting lenses in frames.would like 2 know how i can obtain Your pamphlet or books. Can eyeglasses be made where the bificol part is clear, meaning no prescription. I keep taking my eyeglasses off to read. To avoid doing that, I wanted to know, can the bificol part have no prescription. Just plain clear glass. Im not sure I have a good idea of exactly what your asking, but hopefully this will clear up your question. If you wear bifocal lenses currently, you shouldn't need to remove them in order to read things in you near vision. If you are wearing bifocals and your near vision is a bit fuzzy or unclear, perhaps it's time to update your prescription? If you can read a book up-close, generally about 14 - 17inches from your face, without squinting and without extending your arms in order to focus in better then you should have no need for the bifocals in the first place. Finally, if you are not wearing bifocals and only wear glasses to correct your distance vision, and you are finding it difficult to see things clearly up-close, your Optometrist should be able to adjust you prescription, i.e. bifocals etc., and correct this issue. then the top set of numbers is for your right eye and the bottom is for your left. The first number for the right eye (-2.00) is called the Sphere power. This number is a measurement of the arc or the curve that has been cut into every axis on the back side of your lens. This number generally is adjusted to correct the shape of your eye ball. I know that sounds a bit weird, but you can understand that when light enters the eyeball of a person who's eyeball may not be as round as it should be and instead might be bit more oblong like a football, this light hits the retina at a different angle than it should and results in unclear vision. The second number for the right eye (-1.00) is called the cylinder power. This corrects any astigmatism you might have. Having an astigmatism just means that your cornea(the very front part of your eye) maybe isn't as round as it should be, and this is what is causing the light to fall on the retina differently than it should. This type of correction has to be more precise. This is the reason for the third number in the prescription for the right eye (050). This tells us that at every axis on the back of your right lens, a -2.00 curve has been cut. But on the 050 or 50th axis, a -1.00 curve cut into the lens. If made properly, and if you are fitted properly when you select your glasses, these two curves should cross directly over your pupil and correct your vision. Having a bifocal with this prescription just means adding the necessary magnification to the overall prescription. Adding a +1.00 add power or bifocal to this prescription only changes the sphere power and does so algebraically. So if your right eye is -2.00 -1.00 X 050 with a bifocal add power of +1.00, then in the bifocal portion of your lens, the actual prescription would be -1.00 -1.00 X 050. The bottom number I gave assumes no astigmatism and only gives a Sphere power. A bifocal with a +1.00 add power essentially removes the prescription from the lower portion of the left lens, removing any correction. So yes, there are ways to remove, or a better word would be balance, the prescription by using an add power that brings your lenses back to zero in the reading portion. This cannot be done with every prescription, but it will for some. Hope I didn't confuse you. Have a good day. I have a question regarding the lenses in my glasses which correct for nearsightedness and are also "transition" lenses. I go to a local eye doctor and her staff cuts the lenses in-house. They've already done the lenses twice for me and each time, when I take the glasses off and hold them toward a bright light, I can see very fine lines on or in the lenses, almost like someone took a comb and ran it in random patterns over the lens. The woman at the eye doc's place told me it was from the "check," a metal part of the machine that cuts the lenses. She implied that if I can't see the lines when I wear the glasses, it wasn't a big deal. I disagree as I don't see why the lines should be there in the first place. And I don't want to have a problem in the future, like after the 30 day warranty runs out. Have you ever heard of line patterns like this showing up on lenses when they've been cut properly? Thanks for any help. is it possible to use a tinted glass with the right color spectrum instead of prescription glass lenses? I mean it wouldn't be impossible exactly you would just need the right chemical formula. My college friend and I are conducting an experiment to see if it is possible for a person to see through color tinted glass instead of a prescription. I implied that it would be possible and he said it couldn't be done. I'm curious to know where the backlog of work is located in the process? Is it in the blocking or polishing or bevelling or maybe the testing or dispatch? ie. that place where there is typically the largest amount of work in process (inventory) waiting before it. Re bifocal lenses: I can see multiple irregularities in the bifocal lens portion of my glasses. I do not see the same irregularities elsewhere in the lenses. I see these curvy, irregular lines when I remove my glasses and observe them with my naked, nearsighted eye at a distance of about 12 inches. They remind me of the surface irregularities on a fresh bowl of Jello. At the optometrist office , they insist I have scratched the lenses through carelessness. After wearing glasses for about 80 years, 45 with bifocals, I think I know how to take them off and put them down without scratching them. This imperfection appears to me as though the bifocal lens were bonded to the front of the larger lens, and the bonding material had ripples in its surface before the two pieces were united, but I can't find any description of how bifocals are manufactured. Can you explain the manufacturing process or how this imperfection has occurred? And who should be responsible to fix it? Although I can read most print with these glasses when having regular check-ups I usually have to move my head slightly to look through a different part of the bifocal lens to be sure about small print. Can you tell me I'm not just crazy? I'm sure that's what my optometrist thinks.